For the British actor, see Marcus Roberts (actor). Marthaniel "Marcus" Roberts (born August 7, 1963) is an American jazz pianist, composer, arranger, bandleader, and teacher. Roberts was born in Jacksonville, Florida. 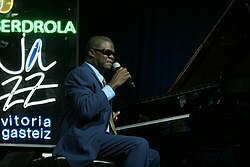 Blind since the age of five due to glaucoma and cataracts, he attended the Florida School for the Deaf and the Blind in St. Augustine, Florida, the alma mater of blind pianist Ray Charles. Roberts began teaching himself to play piano at an early age, had his first lesson at age 12, and then studied the instrument with pianist Leonidas Lipovetsky while attending Florida State University. In the 1980s, Roberts replaced pianist Kenny Kirkland in Wynton Marsalis's band. Like Marsalis's, his music is rooted in the traditional jazz of the past. His style has been influenced more by Jelly Roll Morton and Fats Waller than McCoy Tyner and Bill Evans, with an emphasis on ragtime and stride piano rather than bebop. His album New Orleans Meets Harlem, Vol. 1 (2009) covers music by Scott Joplin, Duke Ellington, Morton, and Waller. He was commissioned by the Atlanta Symphony Orchestra and the Savannah Music Festival to write his first piano concerto, Spirit of the Blues: Piano Concerto in C-Minor. He has performed as a soloist in symphony orchestras with Marin Alsop (1992) and Seiji Ozawa. He returned to Japan in September 2014 to share the stage with Ozawa and the Saito Kinen Festival Orchestra. In 2012 he founded the band The Modern Jazz Generation, which released its first album in October 2014. This band has 12 musicians ranging in age from early 20s to 50s. He served as Associate Artistic Director for the Savannah Music Festival as well as the Director of the annual Swing Central high school band competition. He is on the faculty at Florida State. In 2014, Roberts was profiled on the television show 60 Minutes. ^ Hinson, Mark (March 27, 2014). "Marcus Roberts is next on '60 Minutes' this Sunday night". Tallahassee.com. Retrieved March 30, 2014. ^ Marsalis, Wynton (March 30, 2014). "The Virtuoso: Marcus Roberts". CBS. Retrieved March 30, 2014. ^ Wynn, Ron. "Marcus Roberts". AllMusic. Retrieved 28 May 2018. ^ Wynton, Marsalis (June 22, 2014). "The Virtuoso: Marcus Roberts". video interview. Retrieved March 10, 2016. ^ "Awards and Honors". Marcus Roberts. Retrieved 2016-03-10. ^ "Marcus Roberts | Album Discography | AllMusic". AllMusic. Retrieved 28 May 2018. ^ "Discography". Marcus Roberts. 16 August 2014. Retrieved 28 May 2018. ^ "Marcus Roberts | Credits | AllMusic". AllMusic. Retrieved 28 May 2018. This page was last edited on 9 February 2019, at 23:07 (UTC).